Are you ready for another blog hop? I certainly am. I even have my project finished and again I have days to spare! Oh no! The sky is falling; that's twice already this year that I finished ahead of schedule. 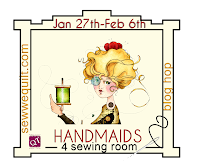 I wasn't able to get signed up in time for the "She Who Sews" blog posts. I really hated that because that would have been right up my alley. I try to envision what I might make for the blog hops before I sign up so I'm not in a pickle later and boy did I have a long list of things I might make. (Sigh). Oh well... I did however get signed up for the "Don't Let the Door Stop You" blog hop. As always, you won't be disappointed so come back and check all the projects out. Below is the schedule for the hop. Mark your calendar. My day is February 5th.